As International Student Advisor​ Fiona Grugan walks to work she is on a mission. Every morning before she enters her office at International Student Services, she makes countless phone calls to lawmakers, forging relationships and promoting policies that support international education and exchange. “I have a philosophy that for political activism people should choose three things to be experts in and advocate for. Personally, my first priority is international education and anything related, such as immigration issues that could affect international education. Because of my work it allows me as a citizen to meaningfully engage with my city, state, and federal officials,” said Grugan. 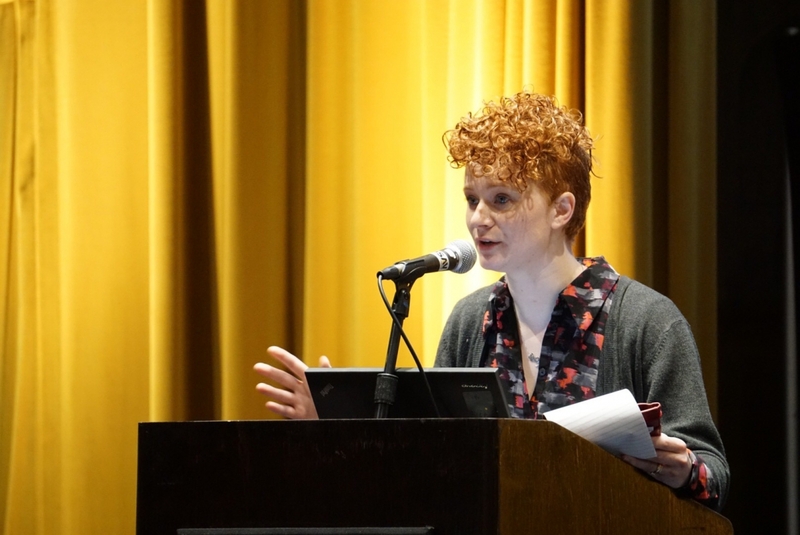 Highlighting her persistence, Grugan was recently honored with the NAFSA Advocate of the Year Award, a recognition of her international advocacy at the grassroots level. 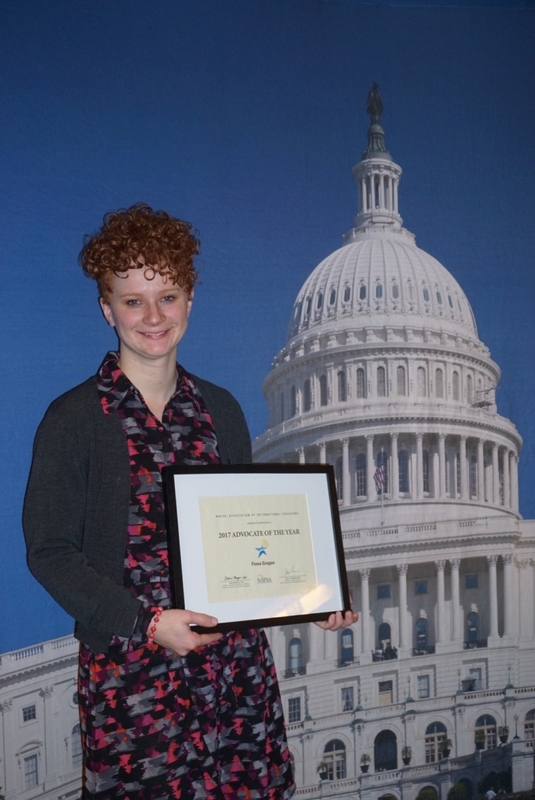 She accepted the honor on March 14th at NAFSA’s 2017 Advocacy Day in Washington, D.C.
At NAFSA’s 2017 Advocacy Day, students and scholars gathered to strategize and advocate for policies important to them and their communities. They also received materials to educate Congress about how international education impacts specific states and districts and why it is important to promote a welcoming United States. Armed with their newly-acquired tool-kits, participants headed to Capitol Hill to meet with elected officials. Organizing an advocacy campaign may appear daunting, but Grugan wants to assure others that engaging with lawmakers is not as difficult as it might seem. “If you make one call a week for a year, that’s 52 more calls than you were making, and it might only take three minutes at a time,” said Grugan. She added: “Have a base knowledge of with whom you are speaking and their platform. Understand what your representative or senator is doing about a specific law. Have a general sense of what they’ve said, for or against a policy. Maybe you call to thank them. It isn’t always calling to complain; it’s about building relationships." Speaking with colleagues of Grugan, they describe her motivation as giving a voice to people who may be unable to promote higher education on their own behalf. “In her efforts to bring upon changes to benefit non-citizens, Fiona has engaged in letter-writing campaigns and serves as a precinct committee person for the Pima County Democratic Party where she promotes the importance of giving non-citizens access to education,” said Stacey Buchman, a Coordinator for SEVIS Compliance who nominated Grugan for the NAFSA honor. “Fiona is motivated and empowered to create the change that she wishes to see in a global society. She serves as an agent for those who are unable to advocate for themselves." Grugan said she is excited for the doors this award might open. In the meantime, she isn’t easing her advocacy efforts. “Right now, I am developing a plan to see how I can take this knowledge and make it more impactful. I’m thinking about how I can do this more effectively to reach more interested people,” said Grugan.